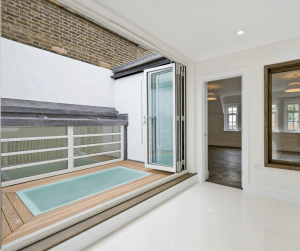 This residence on London’s Marylebone High Street was undergoing restoration with a desire to update its appearance and also add much-needed fire safety measures, to ensure the well being of future residents. The project was managed by Prospero and involved the installation of smoke control systems, based on the principal of ventilating smoke and hot gases in the instance of a fire. Such systems allow for clear escape routes – saving lives – and simpler access for fire and rescue services – saving assets; hot smoke is significant health and property damage risk and installing such a system makes sense even in historic buildings such as this. In line with the contemporary feel of the refurbishment, the architect has decided on a light, airy feel to the building. 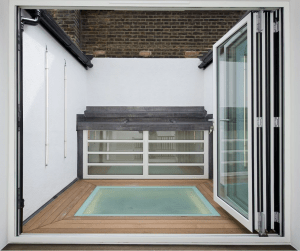 Greenwood Louvre was called in to aid with the design, supply and installation of a bespoke-designed glass louvred ventilator, forming a major part of the smoke control system without compromising the look and feel of the project. The challenge was to blend a fire-engineered solution into a highly visible area within the residence, creating a fully-functional and aesthetically-pleasing product that will look great day-to-day and vent smoke away from the stairwell in a fire. Georgian properties were, of course, not designed with smoke control in mind, so Greenwood’s solution was all the more impressive in spite of the building’s layout and architecture. The finished system not only served its purpose of fit and function, but actually complimented the space.